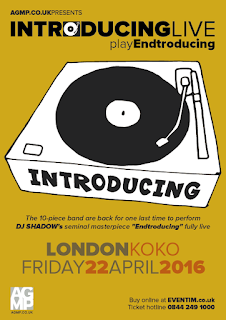 I long ago professed to DJ Shadow's Endtroducing being my all time desert island disc*. It's never left my side though truth be told I don't listen to it all that regularly. That being said I know it note for note, scratch for scratch and sample for sample. I just recently downloaded Endtroducing..... (Excessive Ephemera) from the Reconstructed box set and it's a great piece of work. Seeing your favourite album played live in it's entirety is not something that usually happens. I did see Jane's Addiction play Nothing's Shocking and it was mind-blowing, so I'd love to see him play Endtroducing live. Whilst I wait and remain hopeful of that chance something intriguing has come up. 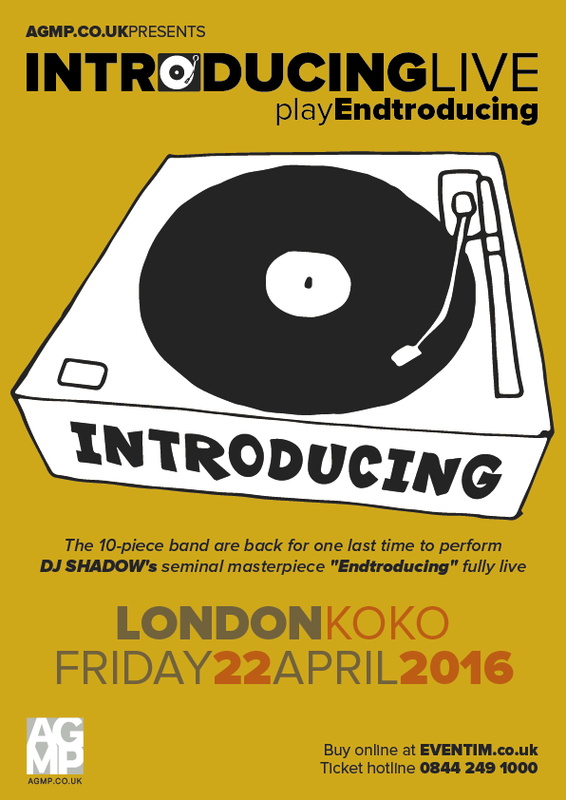 To celebrate the 20th Anniversary since it's release INTRODUCING LIVE are back for one last time to perform DJ SHADOW's seminal masterpiece "Endtroducing" fully live. INTRODUCING LIVE are a 10 piece band who have also taken on reproducing the work of Daft Punk & Mr. Scruff in a live format to huge success. "Endtroducing" was the first album to be composed entirely of samples (The Guinness Book of Records) - INTRODUCING LIVE play the album in order, completely live, note for note, drum loop for drum loop, on real instruments with no backing track or sequencing in sight, a seemingly impossible task they make look easy. Though I've yet to pull the trigger on tickets, which you can buy HERE, I anticipate that the experience will be an unforgettable one for fans of Endtroducing and of live music. *The only album to come close to taking the title from Endtroducing is DJ Solo's dark and moody masterpiece Apocalypse. Seeing as this is a continuous mix, reportedly recorded whilst on mushrooms just makes it all the more outrageously magnificent. I listen to this a couple times a week. But, as it stands Endtroducing is still my top choice. Tricky Presents Skilled Mechanics - "Diving Away"